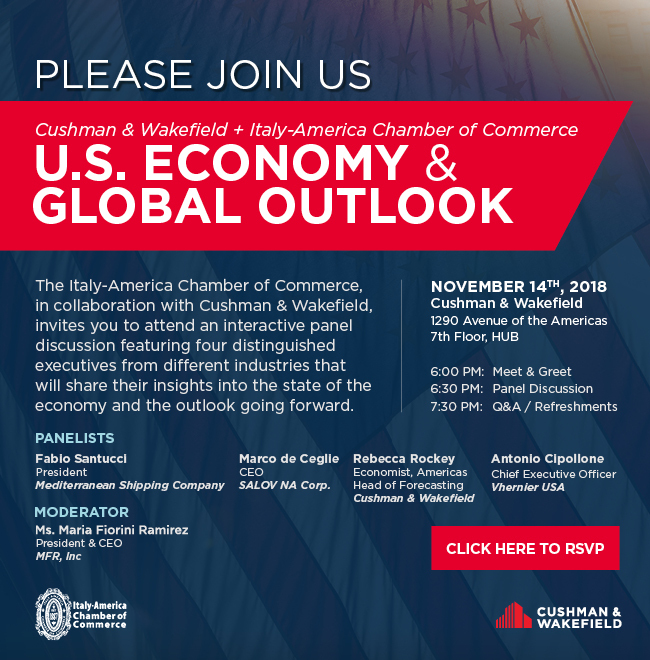 November 14th, 2018 was the date of the U.S. Economy & Global Outlook organized in collaboration with Cushman & Wakefield. This interactive panel featured four distinguished executives from different industries that shared their insights into the state of the economy and the outlook going forward. Panelists of the evening include: Fabio Santucci, President of Mediterranean Shipping Company; Marco de Ceglie, CEO of Salov NA Corp; Rebecca Rockey, Economist, Americas Head of Forecasting for Cushman & Wakefield and Antonio Cipollone, CEO of Vhernier USA. The panel discussion will be moderated by Maria Fiorini Ramirez, President & CEO of MFR, Inc.